Vision 2020 is a high impact day for growth-minded entrepreneurs that will feature brief, but impactful keynotes from disruptors, visionaries, and leaders in the fields of technology, money, innovation and leadership. Now that sells the conference itself pretty darn well, but if you’re reading this you’ve already bought your ticket. 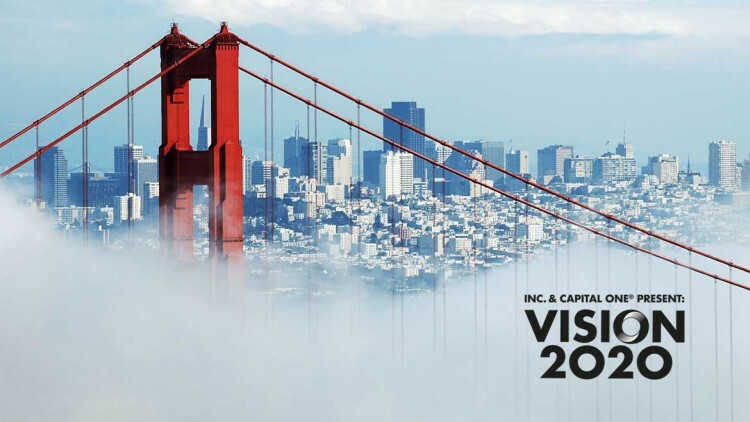 If you’re like so many other entrepreneurs and small business owners out there, you’re probably waaaay too busy to be traveling all the time, and Vision 2020 might be your first time in San Francisco. If you’re not familiar with the city, that can add layers of stress on top of the anxiety stemming from the thought of leaving your business behind for a few days. But worry not, soldiers of the American dream… we’ve done the research for you. Here are some pro-tips on how to make the most out of your stay in the City by the Bay. And don’t fret, your business will still be in tact when you return home from the conference, and you’ll be ready to go at it with some fresh ideas and great new connections from the show. The Breakfast Meetup: What better way to start your day off than with free breakfast? Coffee, tea and food is on the house, and you can warm up your networking skills while you casually mingle around to find the sugar. Chat & Chew Lunch: Yes, more free food! Lunch is promised to be delicious, and there’ll be plenty of like-minded folks for you to rub elbows with. The Vision 2020 After Party: This two-hour event is meant to help you wind down from the long day of learning and give those new ideas some time to simmer. Chill out with your new friends from breakfast and lunch, or take the time to make even more great connections – either way, enjoy the complimentary refreshments and post insights to your followers using the official summit hashtag #Vision2020. Ready to plan your day? View the full agenda here. The Village is a unique event space (think actual vibes and atmosphere versus the typical white walls/drab carpet found in most meeting venues) in the heart of San Francisco. Entering The Building: The venue has two guest entrances, each with its own address. So if you’re GPSing it, use either 969 Market Street or 470 Stevenson Street; either one will get you into the right place. Internet Access: The Village does offer up WiFi services, but availability/fees vary with each event. When you arrive, look around for signs or refer to your conference literature for further details. Need to know more, or just want to scope out the space before you get there? Check out The Village’s website here. Full disclosure: these aren’t the only highly-rated hotels with rooms remaining, but we tried to care for your budget when making this list so only hotels under $210/night were considered. Who doesn’t want to look their best? But who doesn’t also want to be practical? Here’s the thing: yes, this is a business-oriented conference and there are networking events involved, so you’ll want to present yourself like the savvy and awesome forward-thinking business person you are. But keep in mind, this is a one-day event and therefore the agenda is jam-packed with keynote speakers and presentations; you’ll be doing a lot of sitting. It’s a long day too, 12 hours from start to finish. So realistically, you should look presentable but also make sure you wear something comfortable enough to keep you going all day – it’s worth it! Remember folks, weather predictions change frequently. Be sure to check the forecast again before you leave and pack accordingly. And don’t just think about the conference. If you’re staying in the city for a few days to see the sights, be sure to bring walking shoes! Walk: This may seem like a “duh!” type of thing, but really, San Fran is a pedestrian-friendly city and you should certainly take advantage of it if you’re able to. For example, did you know that as long as you’re in the cross walk you have the right of way? Yep. Even if it’s unmarked, pedestrians have the right of way when crossing the street. Of course, don’t just willy-nilly walk around and expect cars to swerve around you like a game of Frogger; be smart, and look both ways before crossing like you normally would. Just know you don’t have to run for your life if you’re mid-cross and a driver is approaching the intersection at a safe speed (and paying attention). The City by the Bay has also implemented some advanced safety features for folks on foot, and if you’re curious you can read more about them here. Hitch A Ride: Don’t actually hitch please, it’s dangerous. That being said, if you’re a fan of taking a car around (but not driving yourself) you have some options. For one, Uber operates throughout the Bay Area, as does similar service Lyft (links to both can be found below). If you’re more of a fan of the traditional cab experience, you’re in luck! Taxis are plentiful throughout the city and you can call ahead for a pickup (some services even offer booking via apps/websites) or just go ahead and hail one on the street. A small word of warning though, in the Financial District/Union Square area of the city (the neighborhood you’ll be in for the conference), it can be especially difficult to snag a cab on the street during peak commuting times. The San Francisco Municipal Transportation Agency (also known as Muni)Pros: Pretty extensive list of options for your ride (from buses to cable cars), offers multi-day passes to save on fares, and serves every neighborhood/district within city limits. Cons: Can be exceptionally crowded during peak hours, and Trip Advisor calls Muni’s service “notoriously unreliable,” so don’t say we didn’t warn you. Pros: Fast service between major points of interest within the city, and also offers transportation in and out of San Francisco (pro tip: this is probably your best bet for getting into the city from the airport). Cons: Not a 24-hour system, and there are no “unlimited use” type passes – all fares are based on the distance of the ride. California Sea Lions: No doubt you’ve heard of these cuties, but have you seen them? If not, you should head down to the bay and catch a glimpse. Learn more about their storyhere. Muir Woods National Monument: Only about a half hour drive out of the city, this is the place to go to see those famous (and incredibly majestic) Coastal Redwoods. Chinatown: San Francisco’s Chinatown is the oldest community of its kind. The best part? It’s just steps away from The Village. You’ve just got to squeeze this famous neighborhood into your trip. North Beach/Fisherman’s Wharf: This neighborhood is one of the most popular destinations for tourists within city limits. What can you find here? An aquarium, several piers, sea lions (more on that below), restaurants, and tons of museums and other family-friendly activities – just in case you brought the family. Union Square: Another spot super close to the conference venue, this plaza is a premier shopping and dining destination. Lombard Street: This winding street is known for its zig-zag pattern, squeezing eight hairpin turns into one city block. Cable Cars: They look more like trolleys, but these classic people movers are actually driven by an underground cable. Alcatraz: Former prison, also known as The Rock, Alcatraz Island is a national park these days and worth the trip if you have time. The Golden Gate Bridge: DUH! You just can’t leave San Fran without seeing this iconic modern marvel. As with everything else, there’s tons more to see and do in the area than we could ever possibly list out, so don’t be afraid to explore! Brick-and-mortar operations may have to pause while you’re away, but getting paid doesn’t have to! Stop sending paper invoices from your desk and start billing customers from any connected device, anywhere in the world. Give Bill Flight a test flight for free and start sending invoices in a jiffy. Have any hot tips on San Francisco, CA and the surrounding area? Super stoked about going to Vision 2020 and just want to let out some excitement? Leave a comment below and let your inVoice be heard!